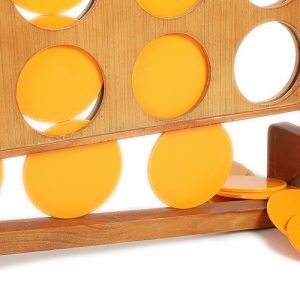 Checkers Chinese Giant includes a boards Diameter is 68 cm of Pine wood. 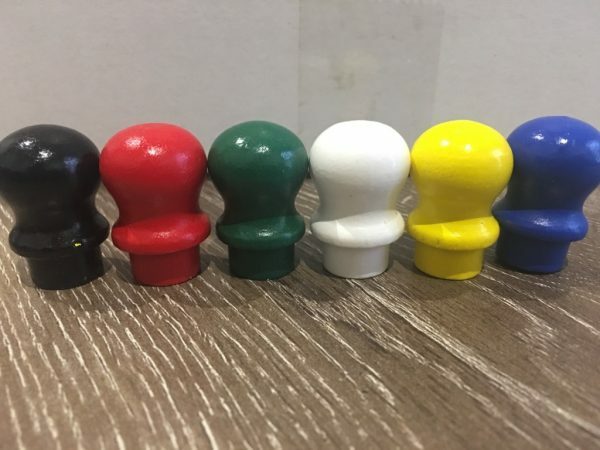 It comes with 60 Pawns that are separated by 6 different colours . 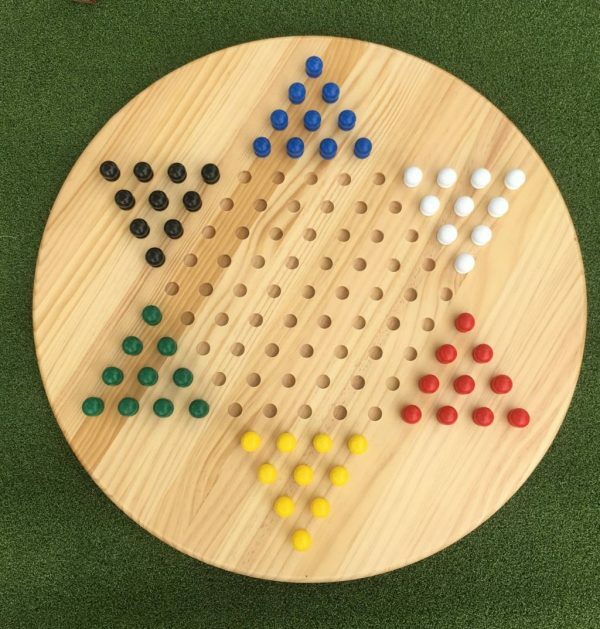 The aim is to race all one’s pieces into the star corner on the opposite side of the board before opponents do the same. The destination corner is called home. 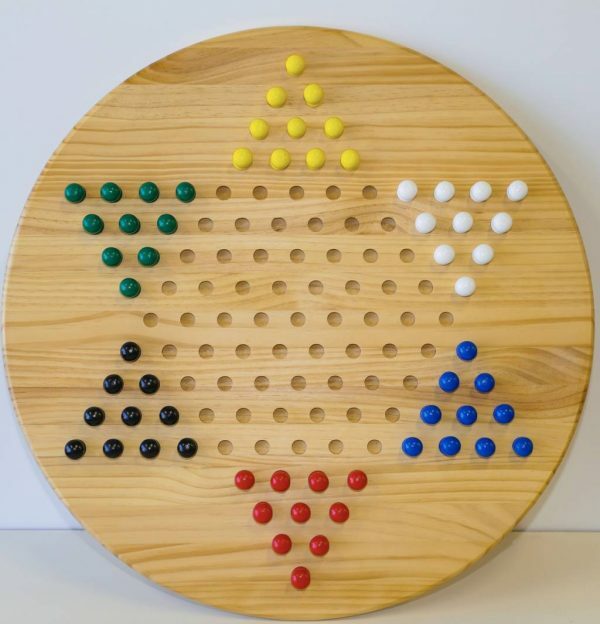 Each player has 10 pieces, except in games between two players when 15 are sometimes used. 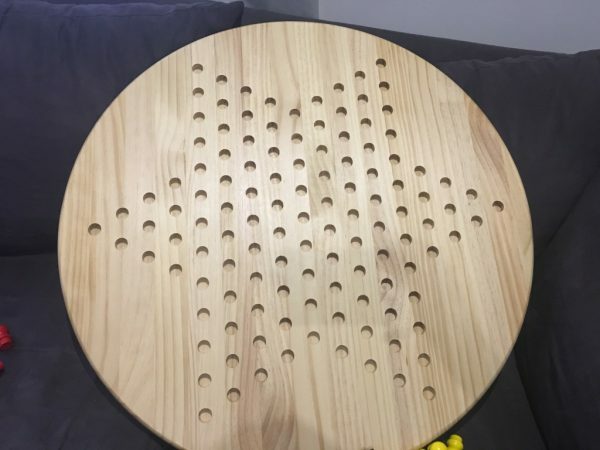 The boards Diameter is 68 cm of Pine wood. It comes with 60 Pawns that are separated by 6 different colours . 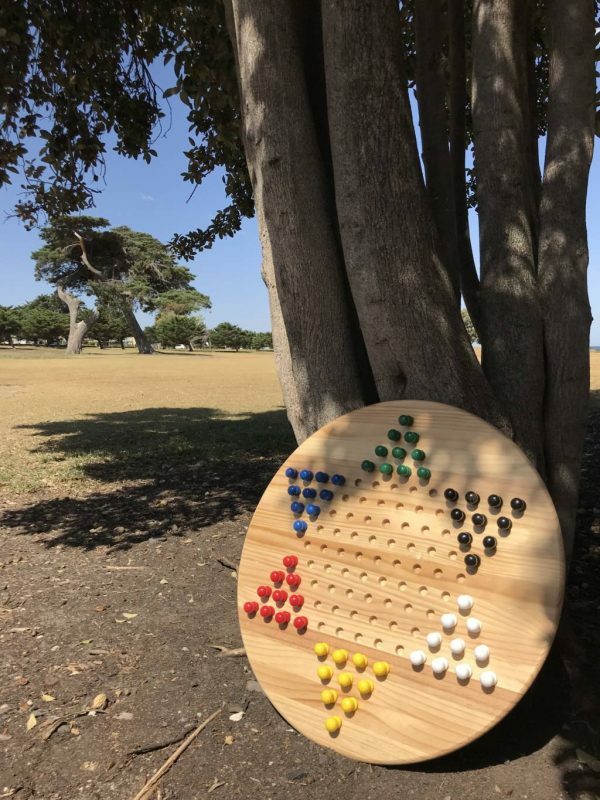 The aim is to race all one’s pieces into the star corner on the opposite side of the board before opponents do the same. The destination corner is called home. 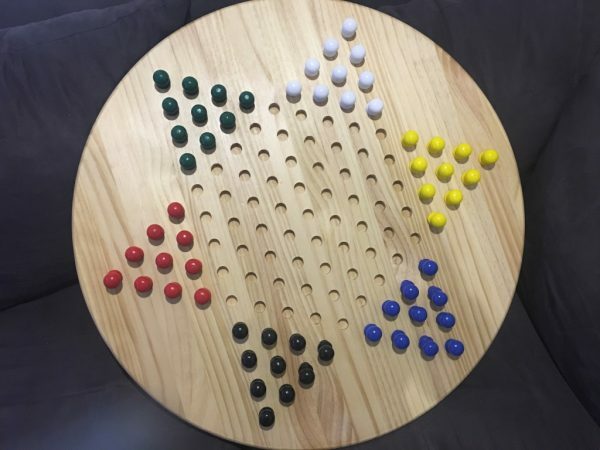 Each player has 10 pieces, except in games between two players when 15 are sometimes used. A toss of a coin decides who starts. Players take turns to move a single pawn of their own colour. In one turn a pawn may either be simply moved into an adjacent hole OR it may make one or more hops over other pegs. Where a hopping move is made, each hop must be over an adjacent peg and into a the vacant hole directly beyond it. Each hop may be over any coloured pawn including the player’s own and can proceed in any one of the six directions. After each hop, the player may either finish or, if possible and desired, continue by hopping over another pawn. Occasionally, a player will be able to move a pawn all the way from the starting triangle across the board and into the opposite triangle in one turn! Pawns are never removed from the board. However, once a pawn has reached the opposite triangle, it may not be moved out of the triangle – only within the triangle. 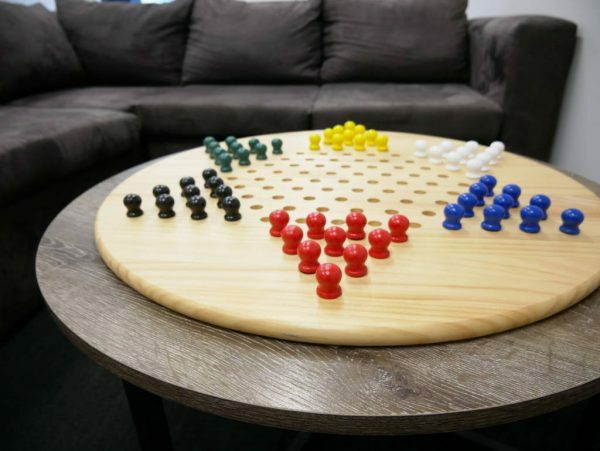 The question soon arises as to whether it is possible to move a pawn into a triangle that is the starting or target triangle for another player. 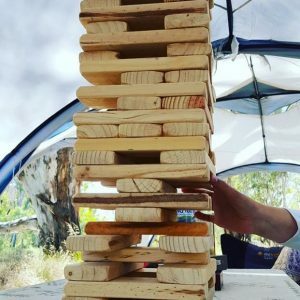 Jenjo Epic is played by taking one block out of the tower at a time & placing it on top. 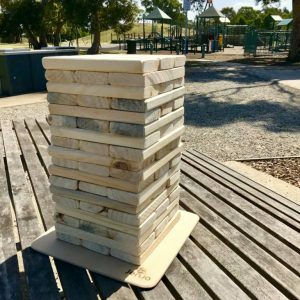 The finishes once a block/blocks falls from the tower. . Homemade Jenjo Epic consists of 54 indivually sanded wooden blocks. It is Australian Made. Height is 38cm & 21cm Wide at the beginning of the game. Ideal game for engagement parties, weddings, community events, outdoor activities, birthdays or social gathering. Played by all ages 8+ and Rules Included. Tug Of war (also known as war of tug, tug o’ war, tug war, rope war, rope pulling, tug rope or tugging war) is a sport that directly puts two teams against each other in a test of strength. 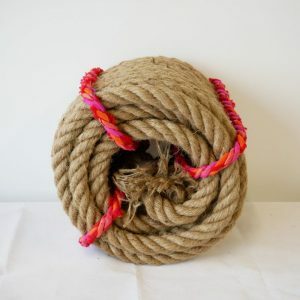 It includes Rope Length = 20 metres, Rope Thickness = 3cm Diameter, Ideal game for kids parties, weddings, community events, outdoor activities, birthdays or social gatherings. Played by all ages 3+ and Comes in a cardboard box. 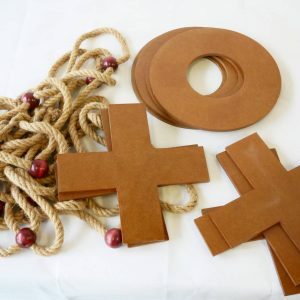 Giant Naughts and Crosses wooden fantastic game to get your kids thinking strategy, schools, weddings, birthday parties, sporting activities or even just some family fun! 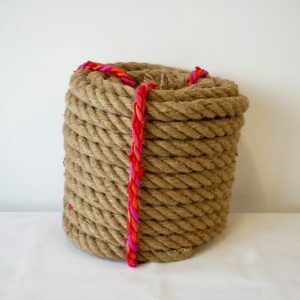 It Includes Five X wooden pieces measuring at: 26cm width & height, Four O wooden pieces diameter of: 29cm, Large Rope measuring at 1.5metres square, Rules Included. Overall weight of set = 4kg and Comes nicely packed in a cardboard box. Four In a Row Premium is suitable for outdoor or indoor use. It’s removable slot in legs for easy storage and only takes 1-2 minutes to put together. 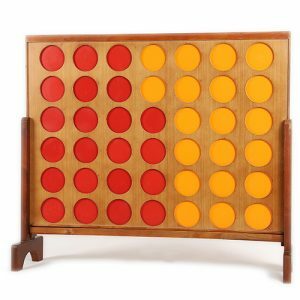 It includes lightweight frame and 42 discs (21 each yellow and red colour). It is suitable for 2 or more players age above 3 years. 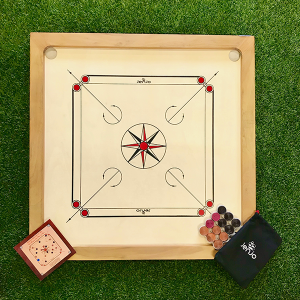 Carrom is a strike and pocket table top board game. The game consists of a board and tokens also known as strikers. 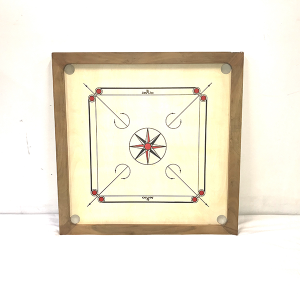 Carrom is very popular in countries such as Sir Lanka, Nepal, India, Pakistan and surrounding areas. Alot of Cafes and clubs around these countries hold regular tournaments.